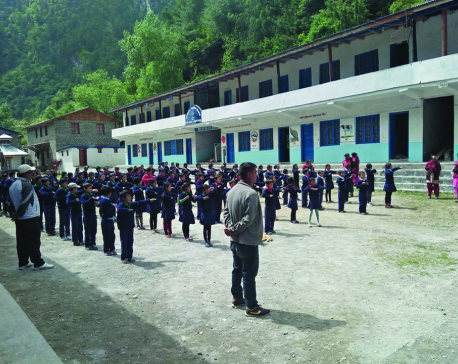 JUMLA, March 27: Students of Ganga Devi Elementary School located near the district headquarters Khalanga have started attending classes regularly following the availability of water at the school. Earlier, they were not regular. Even those who would come to school used to return home after the first or second break. In those areas, bringing water or snacks to school is not common. If they feel uncomfortable while staying at school, students just leave. “We had not become able to provide even essential thing like water at school, but now there is no problem,” Adi stated. Ten child-friendly taps have been installed in the school in addition to conducting a cleanliness drive. The initiative was taken by the Hatemalo Sewa Samaj, Jumla. According to Tasi Bahadur Adi, a teacher at the same school, availability of water is the main reason behind the regular attendance of the children although the school management committee has worked in other areas as well to retain the students. According to the school teachers, a huge number of children are still out of school in the district. And bringing them to school demands a real effort. “Though this area is not very far from the headquarters, people are backward in terms of awareness. While rich people send their children to boarding schools, people from the poor families hardly send children to school,” said Tasi. Another school located at Paratasi Rural Municipality has 295 students. However, it has been just a little while that a sizable number of children are seen at the school. According to Laxman Bohora, chairperson of Paratasi Rural Municipality, lot more needs to be done for quality education and comfort of children in schools in rural areas of Jumla. “The number in register and the actual number of students coming to school often varies. This is the reality in most of the community schools,” noted Bohora. “Not just admission of students, but retaining them is also a challenge,” he added.